Notes: Abbey Foregate was located on the Great Western Railway (GWR) company’s main line from Birmingham Snow Hill to Birkenhead Woodside. The section of line on which the station stood had been built as a joint line by the Shropshire Union Railways (SUR) and the Shrewsbury and Birmingham Railway (S&BR) and it ran for 10 miles between Shrewsbury and Wellington. Known as the Shrewsbury & Wellington Railway (S&W) construction on the line began in 1846 and it opened on 1 June 1849. The interest for the SUR was to create a link to Shrewsbury from Wellington for its line from Stafford which also opened on 1 June 1849. For the S&BR the line was necessary to create a through route, the first part of which opened between Wellington and Oakengates, when the joint line opened. It was extended to Wolverhampton on 12 November 1849. As soon as the SUR line had been completed it was leased to the London & North Western Railway (LNWR). On 1 September 1854 the S&BR was taken over by the GWR which made the S&W a joint railway of the GWR/LNWR. On 1 May 1857 the GWR introduced a Birmingham - Birkenhead passenger service onto the line and on 1 October 1861 a London Paddington - Birkenhead service. Abbey Foregate was located only 38 chains to the east of Shrewsbury station which had opened on 1 June 1849. It first appeared as a ‘ticket platform’ in a working timetable in 1866. Such platforms were provided just before some principal stations, where railway staff could enter a train to inspect or collect tickets before it reached the station; this procedure allowed alighting passengers to pass through the station exit barrier quickly and thereby reduce crowding. As a station it was first shown in a timetable in June 1868. The station was located to the west of Monkmoor Street which passed over the line on a bridge. The station consisted of a single island platform located on the down side of the line (Shrewsbury direction). It was linked to Monkmoor Street by a set of steps. There were goods facilities at Abbey Foregate located on both sides of the line. On the up side (Wellington direction) there was a large wagon shed and ancillary buildings served by three sidings. On the down side there were a small shed, four sidings and a weighing machine. At the western end of the goods facilities on the down side of the line was a signal box which controlled Abbey Foregate Junction and the area around the station. Abbey Foregate Junction is the point at which the main line to Shrewsbury station and a direct line towards Hereford diverge. It is the eastern point of a railway triangle that links the Birmingham, Hereford and Chester lines. In June 1868 Abbey Foregate was served only by LNWR trains running to Shrewsbury from Stafford. Because of this it appeared only in the LNWR timetable. The station was also used on Shrewsbury race days until 1887. In April of that year it appeared in the Bradshaw timetable as a ticket platform for alighting only. The December 1895 timetable showed only one train calling at Abbey Foregate on Monday-to-Friday: a down train at 8.51pm. On Saturday there was an additional down train at 1.11pm. A single down train called on Sunday at 3.18pm. All were LNWR services from either Stafford or Wellington. There were no up services. Abbey Foregate station was closed on 30 September 1912. The platform appears to have been demolished by the 1940s by which time the goods facilities had been altered and extended on the up side. Abbey Foregate remained open for public goods, and from 1 January 1948 the station was in British Railways’ Western Region. 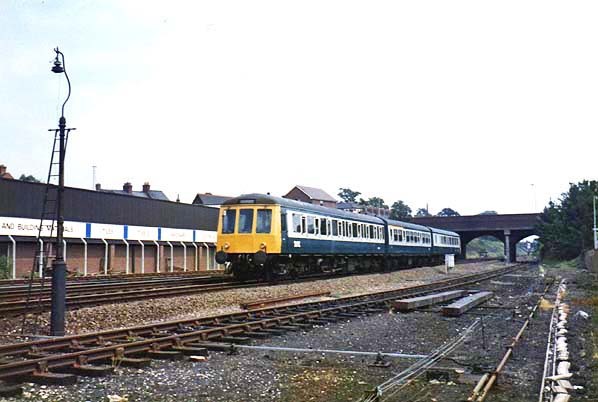 On 1 January 1963 administration of all lines in the Shrewsbury area was transferred to the London Midland Region, under whose jurisdiction the goods facilities were withdrawn on 1 August 1963. By 2016 the areas of land on which both the up and the down areas of the goods facilities had stood had been developed with housing. The site of the platform was still part of the operational railway but no trace of it remained. 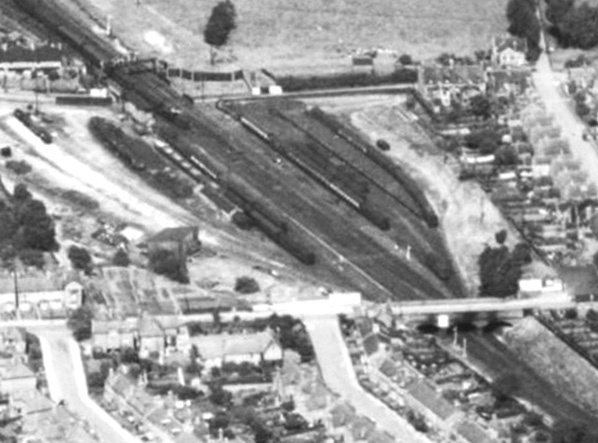 An aerial view from 1948 showing Abbey Foregate. Abbey Foregate station shown on a 1:2,500 scale map from 1900. The station was a single island platform connected to Monkmoor Street by a set of steps. The platform can be seen to the south of the wagon shed the steps being at its east end. There appears to be no form of shelter on the platform. The location of Abbey Foregate station idicated on a six-inch scale map from 1903. The station does not appear to have been named on any maps. 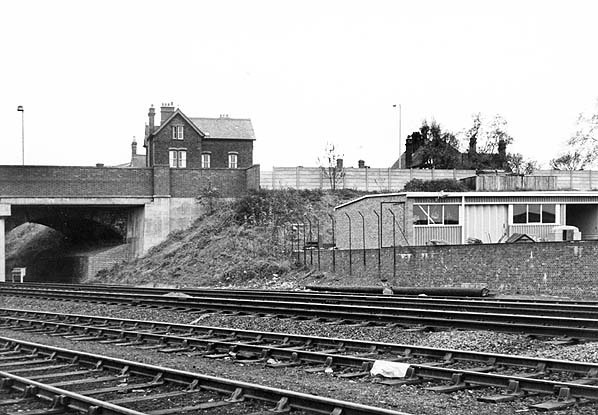 A view looking south-east at the site of Abbey Foregate station in April 1974. The site of Abbey Foregate station looking east on 16 June 1984. The platform had been in the space between the 12:54 Wolverhampton to Shrewsbury train seen in the view and the line to its right. 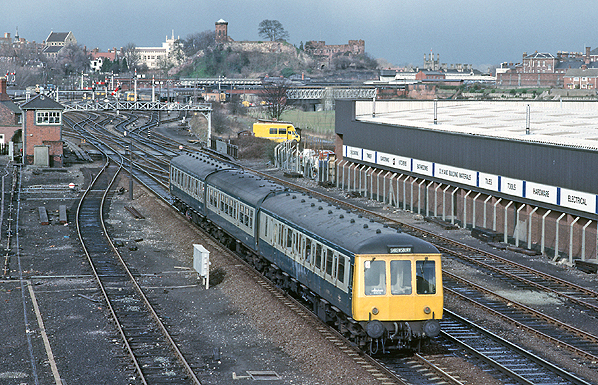 Looking west at the site of Abbey Foregate station on 31 March 1986. The platform was situated to the left of the train. 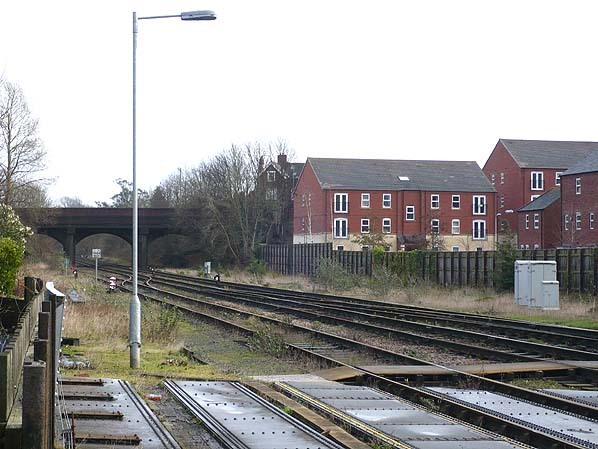 The site of Abbey Foregate station looking east on 8 February 2016. The platform was on the far side of the line to the left of the wooden fence. It was accessed via a set of steps from the bridge seen in the distance. The red brick buildings to the right occupy the goods yard site. 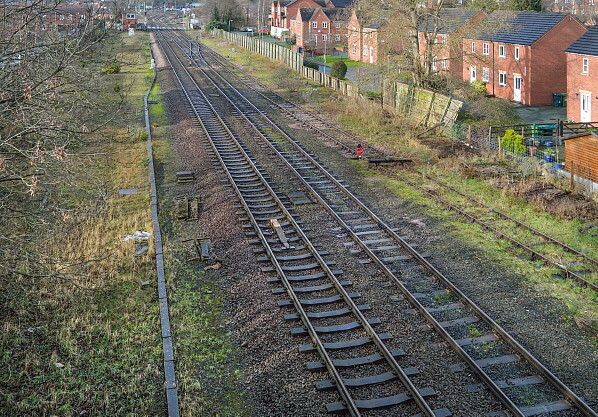 Looking west at the site of Abbey Foregate station on 8 February 2016.